The only thing that makes sense is the entire mosque was green screen that used a real mosque from the outside, and a different location for the inside. 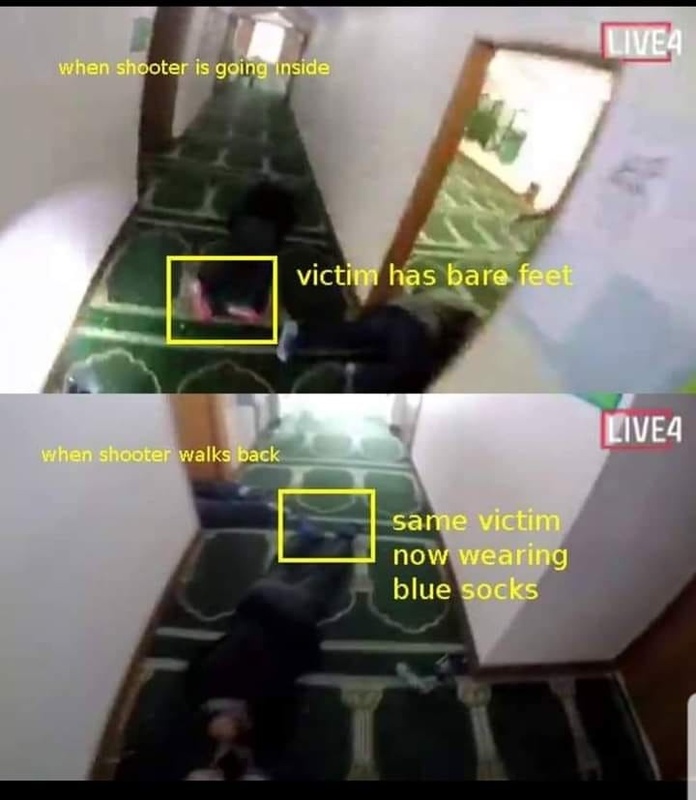 Either way, the blue sock man proves, without question, the shooting never happened. SCROLL DOWN TO THE HEADLINE: I can now shamelessly and without question state the Christchurch shooting was fake for irrefutable proof the shooting was done in multiple video takes, and a continuity error BLEW IT. There is no question – the shooting never happened. The rest is just figuring out how they faked it. It appears (but I can’t find proof) that the Christchurch mosque was NOT a re-purposed structure. IF it was custom built as a mosque from the ground up, the prayer positions would be possible to line up the way they appear in the video, but they’d still never be in the hallway or installed as pictured. And regardless, the carpet won’t put blue socks on a dead man’s feet. I’ll log in and clean up the details below later, because in custom built mosques, prayer carpets do line up. But they are NEVER in the halls, where you can’t see whoever is leading prayer. Another gaffe in this: Mosques don’t have tons of side rooms as pictured in the video, they are (practically without exception) just a huge prayer area with a foyer. So having so many side rooms would strongly indicate that wherever this “shooting happened”, it was done in a re-purposed structure, as I state below. You don’t have half the people praying in rooms where they can’t see who is leading a prayer. It has to be a hoax mosque. We may have a situation with this where the entire video is blue screen that simply used the face of a real mosque, but inside it was a different location. Hollywood does that all the time, and it looks real. That is probably what really happened. BUSTED AGAIN: JUST FROM THE LINKED PHOTO! This “mosque” is likely a blue screen someone put together. Look at the prayer spot patterns in the carpet. Look down the little side hall – there is yet another “prayer spot” marked out on the carpet there. I’m not going to go into how odd it is that there are prayer spots in the hallway carpet at all, (this is very strange because you are supposed to be able to see the guy leading the prayer, if you can’t see him you can’t do the prayer and NO MOSQUE is going to go to the expense of putting that kind of carpet where no one can pray because they can’t follow the leader (another problem) but the one that is in that little entryway takes the cake – you can’t pray with your head against the wall, there has to be a few feet in front of you, it is simply the rules so it can’t be there. CONCLUSION: This is an Ocasio Cortez mosque assembled in a green room by people who did not know how Muslims would actually set up a real mosque, OR it is actually a real structure and someone paid whatever it took to set up an elaborate prop for a hoax video. Hollywood does it all the time, but usually when Hollywood does something they get the details right. No shoes at the door either, which means that particular door is not used, it just happens to be there, you CANNOT wear your shoes on that type of carpet no matter what, you can’t leave without your shoes, they HAVE TO be by the door. No shoes by any door in any mosque that cuts straight to prayer carpet means that door is not used, ANOTHER Ocasio style blunder. Bottom line: Because the Christchurch mosque was a re-purposed structure, the prayer carpet would never line up so perfect the prayer positions shoot straight down a hallway without even an inch of deviation from the walls. Muslims would never set one up that way even if the building did magically line up perfect anyway, and no shoes by the door takes the cake – it’s not real, END OF DISCUSSION. <h3>I can now shamelessly and without question state the Christchurch shooting was fakeThe video was either done in multiple takes, or was created by an AI that screwed up. The mosque may or may not even be real. It is THAT BAD. I’ll try to log in later to upload the most damning evidence yet, but for now I will embed it from elsewhere.In the video, a man was laying in the hallway, not wearing socks. The shooter runs past him to “get his other gun.” On the way back in the same victim is laying in approximately the same position (everyone moved a little, but it is obviously at least trying to be the same scene AND THE SAME VICTIM IS WEARING BLUE SOCKS. Not possible if he really is dead on the floor. This image is hosted by the enemy, posted by the “good guys” where the enemy can remove it. So save it just in case it vanishes before I actually log in to host it from here. This error on the part of the production crew is in the original video also. GAME OVER, I know there are over a thousand people from NZ who read this site and I suggest they print this ASAP and start showing it to people, along with a clear explanation as to what is going on. NZ is getting REAMED by this shooting, Clinton&Co need a safe place to set up a new fiefdom and unfortunately NZ was all too willing to allow this to happen. Now I believe Podesta really was there helping to stage this and that the video was a complete production that was simply played as a “live stream” after the final cut.